Or is there something else? or less than that? 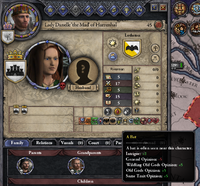 How can I tell what a bloodline actually does, or do I need to go into the game for that? I don't wanna remove the really cool bloodlines, just the ones that are huge and don't do much but opinion boosts. Thank you for the quick response! The rest needs to stay. Hey rufff1 , so.. I'm trying to script in an event where my current player character can inherit his "long-lost" bloodline from an ancestor. Do you know how I'd be able to go about doing that? This is my code so far which only "creates" a copy of that bloodline. I'm not sure how to successfully mesh in the add_to_bloodline command or add_bloodline_member command either. Any ideas? Thanks ahead of time! EDIT: Nvm! All fixed. It was extremely simple actually.. if anyone wants to know how to fix the problem above, shoot me a PM! Last Edit: Feb 10, 2019 21:49:46 GMT by Duryn: Fixed! Is there a way to create the "blood of the conqueror" bloodline after Aegon's conquest of the Seven Kingdoms? I'm doing 5 bloodlines tied to Harrenhal. Lothston Blood: fairly standard bloodline (+1 martial and intrigue) with trait gain allowing for cruel, mystic and the new bat trait I'm making. Vile Blood of Danelle Lothston: created when she goes crazy it gives her another +1 intrigue and plot power on top of her Lothston Blood boosts but a -10 general opinion and the chance to gain lunatic, possessed, cannibal and a new giant bat trait I'm making (distinct from normal bat). Whent Blood: martial boost and combat boost and chance of mystic and bat trait gain (lower chance of bats than the Whents but given their sigil and the apparent magical power of Harrenhal I think its fine to add). The Blood of Harrenhal is essentially rebuilding Harrenhal without having gone crazy whilst gaining some mastery over the magic there so allows for mystic and bat trait gain. Vile Blood of Harrenhal is basically going full Danielle Lothston mid rebuilding, fully embracibg the dark power in Harrenhal with opinion maluses boosts to intrigue and plot power and trait gain of cruel, mystic, cannibal, lunatic and possessed, but it does allow you to get the giant bat trait whereas the plain Blood of Harrenhal does not. If anyone has suggestions/thoughts on these then I'd love to have them. Sounds awesome! Out of curiosity what stat bonuses were you thinking of giving the bat trait? Intrigue probably makes sense, with a martial bonus for the giant bat? And what would their duel combat bonuses be? So the bat gives +2 intrigue, and the giant bat gives +1 intrigue and +2 martial (not as stealthy) seeing as combat bonuses got taken out of the main mod and replaced by duel events I'm not giving them combat bonuses atm. Here are some pictures of the traits in game on Danelle Lothston (thank you to the ever awesome aconda for the trait icon for the bat trait). So as I previously mentioned I'm doing 5 bloodlines tied to Harrenhal. Vile Blood of Harrenhal is basically going full Danielle Lothston mid rebuilding, fully embracing the dark power in Harrenhal with opinion maluses, boosts to intrigue and plot power and trait gain of cruel, mystic, cannibal, lunatic and possessed, but it does allow you to get the giant bat trait whereas the plain Blood of Harrenhal does not. So now Mance Rayder has his very own bloodline. It gives him a martial boost and a boost with free-folk and poets as well as the chance to gain the poet trait. It also has a new icon for it which I have also made his COA (red and black background for his cloak, crows for his time in the watch, and the bronze horn of Joramun). The Thenns also have a bloodline with a martial boost, chance to gain the mystic trait, and a +25 boost to the Thenn religion (they are living gods to them after all). It also has a new icon for it which I have also made their COA (a bronze disc on white for their bronze-working, surrounded by runes of the First Men who they claim to be the last of). 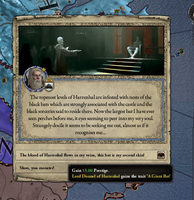 Tormund also has a bloodline with a martial boost and a boost with free-folk, as well as the opportunity to gain strong and brave, also it gives the chance for an event to fire which is shall we say the bear version of the wolf child event from Horse Lords if your character has his bloodline and gets drunk... The bloodline also has a new icon for it which I have also made his COA (a bear and a giant - for obvious reasons - frolicking within a golden runed armband like the ones he wears). The Kingsbloods also get a bloodline to represent their ancestor the Red Raven who ran away after/during the battle where Raymund Redbeard was defeated, it gives a boost to intrigue but an opinion malus with free-folk and brave characters. They also get a new icon and COA (a red raven with a crown over its head). If you become King Beyond The Wall you also get a bloodline. Lastly if you have more than three skinchanging companions and you do not already have this (or Bran Stark's bloodline - more on that later) you automatically forge a new bloodline (and if you want can take a new nickname) - The Blood of the Great Warg. The bloodline basically represents a super strong connection to skinchanging magic and allows you to gain the mystic trait and for an event to fire that allows your descendants to essentially pick to a degree what kind of animal you want to skinchange into. You can't pick specifically, but you can decide that you want a canine (dog/wolf), a flying creature (bat/crow/eagle), or something more docile (cat/boar/goat/deer - the deer being a new addition). The event will not fire if you already have one of these animals, although if you have other ways to gain an animal, ie vanilla skinchanging or you have a bloodline like the Stark, Mormont, Blackwoods etc, these will still work. The event will also not fire for any children of Varamyr Sixskins although he has the bloodline, as he states that none of his children had "the gift", however, the event can fire for grandchildren and other descendants with the bloodline. Lastly the event does not fire for the more difficult animals that can be skinchanged into, so it does not allow for direwolves/bears/shadowcats/lions/cranes/vultures/lizard lions/giant bats, these are meant to be very rare for skinchangers so are not gainable through the bloodline, but can be gained via other means. 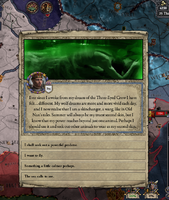 Third and final thing I've been working on recently for the next update is a bloodline for Bran Stark. It always slightly annoyed me that in the books Bran is the most gifted skinchanger in generations, perhaps even greater than Bloodraven, but in the game he never seems to do more than have a direwolf and greensight, so his new bloodline, Blood of the Winged Wolf addresses this. 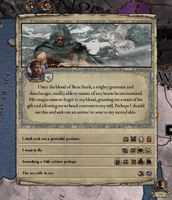 However, this event doesn't trigger for Bran, instead he has a dedicated event chain where he picks the category of animal he seeks to tame (predatory, flying, tame, sea creature) then he can pick from that category the exact animal he wants. To prevent him becoming OP the event has a cooldown of 5 years, which, given there are 18 animals he can theoretically obtain, means that he will die before he obtains them all. Also certain animals are locked to regions, ie he can tame a lion via this method, but only if he is in the Westerlands. Really sorry to hear that - I know that some things, such as the Maester society have been causing excessive memory drain an are meant to have been fixed for the next update so hopefully that should make it easier to run this mod on slower computers. Ah, okay. Thanks for your work on the mod. Highly appreciated! This amazing mod is a must have! I love how much diversity and immersion it adds. Thanks for all the hard work on this mod guys. Can't wait to try this out for myself! got problems with your mod pal ! dragons in my game have human's faces ! I've looked at the save you posted last time and I'm pretty certain that's not stemming from my mod. My mod neither modifies portraits, not cultures, nor does it change the event that gives dragons a random trait that overwrites their portrait with a dragon picture. 1. When you are testing each mod, are you starting an entirely new game or just reloading the same save with different mods active? 2. When you tested More Bloodlines on its own, did you delete it and install a clean version, or did you use the version with the COngenital Overhaul Patch? If you use the congenital overhaul patch version without Congenital Overhaul weird stuff will happen. 3. Did you install BOTH my mod and the congenital patch on top of it? The patch is just a patch, it needs the main more bloodlines files to work.